Each month as I create the thank you note that goes out with your orders I try to think of an image that is appropriate for the upcoming season. This will then allow you to either use it as a color reference and/or create a card with that image :-D I would like to take this opportunity to thank you for the appreciation you share with us when you receive this note and the little snippet of ribbon. I want you to know that you are special to us and I couldn't do this without your support - so once again I would like to thank you so much for being here and shopping with us! To begin I selected the Wreath of Gifts. I had a blast creating this card and want to share another way to use the letters that Julia created for this holiday season. When I asked her if this would be something she could do I told her some of the ideas I had in mind that I wanted them for, along with some patterns I wanted her to create with and she just went to work. I am SO very proud of her and the creativity she is bringing to our team. Thank you Julia! So one of the ideas is to use the letters as ornaments. I felt that the wreath made the perfect letter "O". I colored the packages to coordinate with the beautiful Webster's Pages Sweet Season papers, using a silvery gray ribbon to tie them all together. The fantastic value in these letters is that you can resize them to whatever size you need. To begin follow the instructions in this post. Once you have pasted the letters into your Word document resizing is simple. Note where the red arrows are pointing. Double click on the letter itself and you will see it outlined as shown above. By double clicking it will take you to the "Format" window. On the right side of the page you will see two boxes with dimensions in them. For this project input the number 1 in the first box and click enter. This will automatically resize your letters to 1" in size. Use your space bar to add additional spacing between the letters if desired. I then used a 1 1/8" punch (which has been ordered but I'm still waiting for them to arrive in the store) to create my circle. My next steps were to punch the border trim with my edger punch and sew the trim to the decorative paper. By sewing at this point I am able to hide the bottom stitching. Using a 2-way glue pen around the edge of the circle and dipping the letter in Microfine Glitter gives it that final sparkly touch! Position the ornament letters and wreath by using a see-through ruler. This helps you align them evenly and in a straight line. Yes, the perfectionist syndrome coming out in me again - LOL! Once the letters are positioned it is time to attach the "string." The new Webster's Pages silver trim is AMAZING! The incredulous thing about this trim is that it is linked together with tiny jump ring like circles. I have absolutely no idea how they even manufacture something so delicate. The beauty of this trim is that you can cut it easily with scissors. As I experimented I realized that when you cut it to a single line it falls apart into individual little circles that they look like little bells :-D I love happy accidents! As you can also see in the photo above this one I am becoming addicted to this little bottle of Studio Matte Medium. It REALLY holds and to have a non-shiny adhesion is important to me. By placing a very small dab of adhesive on the top of the ornament I was able to attach my "chain". I allowed this to dry before moving on. Once dry stretch the chain up and over your trim and cut to fit. Then lift the purple trim apply yet another small dab of Matte Medium and attach the upper end of the "chain." Not only does this chain sparkle, but it actually creates a musical sound when you shake the card :) I'm such a sucker for little details like this - LOL! Using my favorite tweezers I then placed little jingle bells on each ornament in the wreath using Matte Medium to hold them in place. A final sparkle was added with the Sakura Stardust pen. I hope that you can use some of these little details in the creating of your holiday cards. Don't forget to set your clocks back an hour this morning! Thanks for stopping in again today and I hope you have a fabulous Sunday. The white frame around my girls with Santa draws your eye and I didn't want to compete with that, but felt that the new Tree was THE perfect piece for the top left corner. What to do? With so many options to select from I decided to start with a simple technique. I began by first spraying the piece with English Ivy Tattered Angels Glimmer Mist. I allowed the liquid to pool in the crevices and then took a paper towel and wiped the surface. The detail that emerged was absolutely lovely, but I wanted just a little more color. After allowing it to dry slightly I then sprayed with a second and lighter color of Tattered Angels Glimmer Mist, Sweet Clover. Immediately I pulled out my Heat It tool and used it to dry the surface. The gentle heat helped to set the beautiful color in place on my surface, with the soft pooling of the color adding dimension. A little glue added with a 2-way glue pen and Sand Glitter Ritz on the star finished the piece. I then used some dry clear glue around what would be the base of the tree and added some white Mica Flakes for snow. It's all in the little details and you know I love details - LOL! Julia was trying to get me to color the presents under the tree with Copics, but I told her that would have to wait for a new project ;-D All I can tell you is that I'm LOVING these little resin pieces and hope to share more with you in the future. For a complete list of supplies please visit yesterday's post. Now it's time to head out into the blustery rain and wind --- a warm house and dinner is on the horizon. Thanks for stopping in again today! 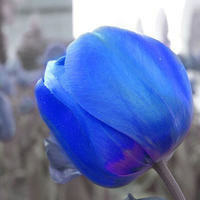 ETA: Be certain to visit the CLASSroom this Monday to join in our Blog Parade - it's all about the beauty of flowers!!! Yesterday was my Mother-in-laws 84th birthday! With each year that passes I learn to value the time we have as even more precious. It has been "one of those" summers for our family - first my daughter Trina had pneumonia, then my DH came down with a severe case of bronchitis (he never gets sick and he was sicker than a dog this time) and then guess who ended up really sick for a couple of weeks now - LOL! Yep, me. When this happens we end up quarantining ourselves from J.J.'s mom as we know that these types of viruses can really be tough on the elderly. So yesterday, I wanted to create a special birthday card to let her know how much she is loved. I truly love the elegant feel of the Webster's Pages products and the 6x6 Diecut and Vellum selection is absolutely stunning. 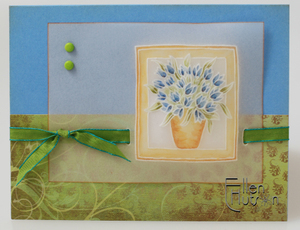 For this piece I utilized one of the die cuts, cutting it down in size and sewing it to my card base. 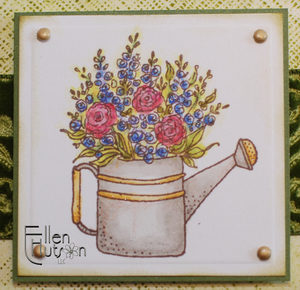 Next, I colored the newest Roses In the Window stamp from Karen Lockhart. I cannot tell you how much I enjoy coloring these images. As always I start with a very light Copic base color to outline the different components in the image. For today's image I selected colors that would work well with this Webster's Pages paper. I forgot to snap a photo of the colors I used, but they are in a bucket on my desk and so I will do that on Monday and add that information for those who like to know which colors I used as I worked. Our orders this month will include our thank you notes that include this image :-D I hope that you enjoy this unusual color take on this image. In today's post I did snap photos that showed how I use the beautiful pearl flourishes we carry in our store. When you first look at them they take your breath away, but then you might wonder - they are so big, how can I use them? I love that they come on a clear plastic. This allows me to position them over my project and determine placement. As you can see in the photo above I wanted to utilize the last larger pearl as the "dot" on my letter "i" in "wish". Once I have this positioned as I would like, I cut the flourish apart using my Retractable Blade knife. Simply cut through the adhesive line that holds these pearls in position and lift the pearls from the surface using the tip of the knife. Gently place the pearls in the position you think will look right. By allowing the pearls to gently sit on the surface, and keeping your knife tip in place, it is easy to lift and change the position before finding a permanent spot. I then use a dimensional adhesive foam square to place my focal image. This does two things - by lifting the focal point away from the surface it makes it the first thing you look at. BUT it also helps to position your paper above the pearls and allow for the extra dimension they provide. If one of my foam squares happens to fall in the same position as a pearl that may be hidden under the edge of my image I simply pick that pearl off using the tip of my Xacto blade. 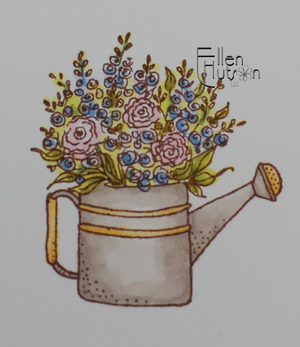 To complete the look I couldn't resist adding some Cotton Candy Stickles to the floral buds. Oh how I wish it was easier to share the final projects with you as my photos just can't seem to capture the colors and texture as I would like them to. My hope though is that you look at the die cuts and pearls in a new way and allow yourself to just cut them up and use them in pieces. They are oh so beautiful!!! It brought such joy to my heart as I watched my MIL gently touch the surface of the card and exclaim how much she appreciated the thought and time put into it. I am so very blessed to have two wonderful women in my life - my own mom whom I love so deeply and a mother-in-law who is also so very loved and appreciated. I had to share a close-up of the fishbowl before beginning just to give you a better view of these splendid little creatures. 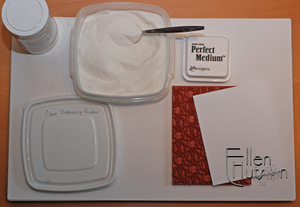 To begin simply take three different distress ink pads and rub them on the non-stick craft sheet. Use a mini mister and spray the surface until you see little beads form. I love the weight of the tags we carry and so used the white tags for this project. They curl when you wet them, but then the flatten right back out when dried. Simply drag your tag through this delicious little color field. The next technique is simply scribbling and dragging a reinker tip through your color field before misting. As you can see the color is so much more vibrant. This photo is to share what not to use - as you can see I used Memento Ink on the first set of fish and when I applied my Rock Candy stickles, well... SO attempt number two using an appropriate ink for this project, in this case Archival Ink. I should have thought about my finished project before selecting my ink - I knew I wanted to add Rock Candy stickles to my fish to bring up the glam factor. As you can see the Memento Ink was not waterproof beneath the stickles. At Ranger U I learned that Rock Candy Stickles can be heated! Yippie - I no longer have to wait to allow this beauty to dry. It is the only Stickles product that can be heated - the shimmer that emerges as it dries is gorgeous! To create the water effect in the fish bowl I rubbed Distress Ink on my craft sheet, lightly misted it and then placed the fishbowl atop the ink puddles. 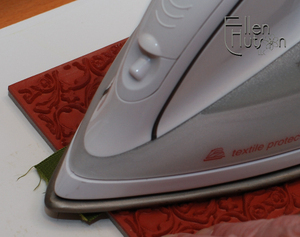 Neenah cardstock will curl, but if you use your Heat It tool to dry it and then drag it over a rounded hard work surface edge in both directions you can eliminate many of the wrinkles and curls that result. We hope that you have fun scribbling and dabbing! The results can be quite beautiful. I will always think back to the magic of "disappearing ink." Writing with lemon juice and then heating the paper to watch it appear. The sophisticated products that we now have that allow us to magically watch a pattern appear still intrigue me as an adult and so my thinking with this project was that kids would find this to be so much fun! The first two tools that I believe will make this process so very easy to clean up are the non-stick craft mats and the craft scraper. 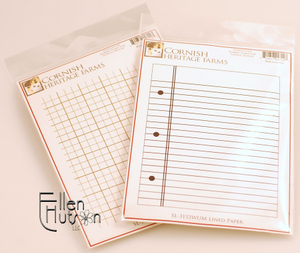 These craft mats come in a number of sizes I am currently working with the XL mat on my work surface so that I can completely protect my tabletop. I then use the smaller one on top of it because it is so much easier to store and carry to the sink if need be. When working with a craft mat allow your paints to dry on the surface and then simply scrap them off using the craft scrapper. It is SO very easy! No more big messes to worry about. Depending on the age of your children you can do the first step of this technique, but this is not about perfection - it's more about the process. Remember all those foam stamps we accumulated! Well, for this project I pulled one of those out. They work fantastic for this type of technique. 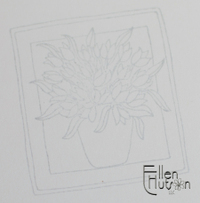 You can also use "regular" stamps as well - the only important consideration is to pick a design that is quite bold such as a silhouette or one with thicker outlines. 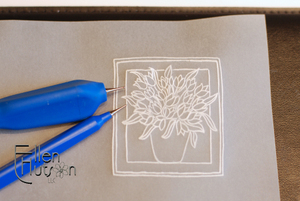 Paint the Matte Medium on your non-stick craft sheet and use this as your "stamp pad." Randomly stamp the image on your Sticky Back Canvas. You can have small diecut shapes, as I have used here, or work with an entire sheet cutting it into pieces later. Using the Heat It tool I dried the Matte Medium - I'm an impatient crafter - LOL! If you want to extend the project out over time you can simply set this aside and allow it to airdry. Using popsicle sticks so that I don't mix my colors in my jars I selected three different Studio paints and dabbed them on my craft sheet. "A little dab will do ya!" Less is more with these paints :-D Then add moisture to your paint with a mini mister, watering it down to a very thin consistency as shown. Using the large size Studio Brush randomly paint your canvas and watch the magic happen. It is so very fun to watch as the design appears!!! 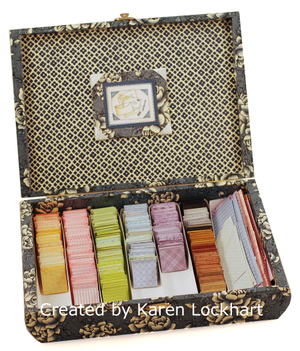 I used Pumice Stone Distress Ink to mute the beautiful colors to coordinate with the Olivia papers. Showing your child how to use the ink blending tool will be so much fun for them. When Trina was creating her Social Studies project it was so fabulous to watch as she adapted the techniques I shared with her to transform her project. Your child's school projects will take on a whole new level if you share some of these little techniques with them! Another wonderful tip I learned at Ranger U is how to use the Studio Paint as an "ink pad." By simply mixing a little Extra Time with the paint and rolling it out on my craft mat I can then use any stamp to add detail to my canvas projects! This will hold up to washing if you want to stamp on fabric!!! I didn't have any hair clips at work, but I felt that these adorable Posies from Basic Grey would make the absolute cutest embellishments when fastened to hair clips. 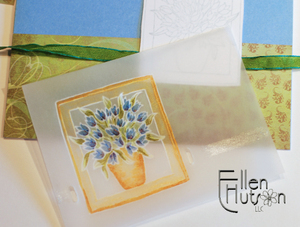 Clip a couple of hair clips to your card and you have a quick and fun gift! Not only will this technique shared today work on Sticky Back canvas, BUT I believe that it will work on T-shirts, tote bags and so much more! The canvas aprons and camera bags we carry are begging for some color. If you haven't seen the fabulous Copic camera bag that Debbie shared yesterday you must visit and leave her a comment. STUNNING I tell you! This could be an absolutely amazing project to explore with not only your younger set, but your teens who want to have unique, custom clothing! I sincerely hope that we are inspiring you to try crafting with kids this summer. If you don't have any of your own, then go out and borrow a few - they really can be so much fun to watch and listen to as they create! As well all of us "older set" are young at heart and can be considered kids at times - LOL! So grab a couple of friends and be as free-spirited as kids when you create. Simply have fun! Thank you for stopping by again today - we hope to see you again tomorrow as we share another idea for a fun summer project! 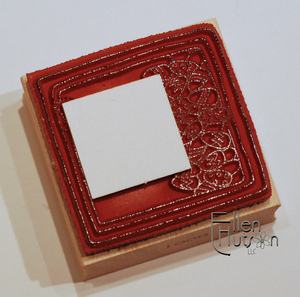 Make certain that the chipboard coaster you are using is large enough to create a pocket to fit your gift card! This next idea is not my own - it was something I saw on the Maya Road design team blog that got my brain a tickin' - you can see their post here! You really do need to visit their blog for some AMAZING inspiration - you will then see why I am SO very in love with their product line. What the designers do with it is exquisite!!! I used a pencil to outline my image. I just didn't have the confidence to start with a marker - LOL! I then used my Copic Multiliner to draw over my pencil lines and darken them. Next I scanned the image. Using Photoshop I cleaned up my scanned image. For those who don't have this knowledge base I do think that you will receive good results doing it the way that the designer on the Maya Road blog did (see link above) but being that I was shooting for precision I just can't leave well enough alone. I then turned my black-line drawing into a transparent file. I know that I am losing some of you with this brief explanation, but I wanted to share this for the more advanced users and my continued explanation below. It was then that I realized that I really didn't have a paper that I found 100% suitable - yes, it had to be baby blue with polka dots - it was what was in my mind and I couldn't let go of it. I then realized that I could really take this to the next level by heading over to my ScrapHD resources! So I did just that! ScrapHD is designed for making easy and quick scrapbook pages, BUT it is also the most amazing resource for these types of projects. Being an intermediate level Photoshop user I can take the images from my ScrapHD files and incorporate them into my projects on Photoshop! I'm in love with this capability and I know that advanced Photoshop users will have the ability to create amazing projects that blow mine out of the water! With the Club Membership I am sent a file that I was then able to open in Photoshop and layer my little transparent onesie over the top to print a perfect little compliment to my chipboard element! WOOHOO - I was so very excited... aww, perfection - LOL! I then printed this on Neenah cardstock. I also printed out the plain polka dot file from ScrapHD onto Neenah cardstock. This was used to create the reverse side. I flipped my chipboard over and traced the onesie - this was my "back side." I traced a second one --- only the lower portion, to create my little "pocket." As you can see I cut just inside my pencil line - this allows for a very nice fit on the backside of the onesie. I saved my "dimensional" onesie - the first one in the ring for a future project. I plan on painting it and playing with the wonderful embossed detail. Using the second piece on the chipboard ring I gave it a more finished look by edging it with a silver leaf Krylon pen. Be certain to allow the silver leaf to dry before continuing to work or you might have silvery goodness everywhere - LOL! I stitched the back pocket along the top side and then stitched it to the coordinating piece, so that the gift card could slip between the layers. This little piece just makes me giggle. It is almost like those little drop-down/drawer style P.J. 's - oh so cute! I selected a coordinating striped paper (My Mind's Eye - Little One) from ScrapHD and scaled it way down so that the pattern would be appropriate for this darling piece. It is yet another reason I am absolutely loving that I have digital files at my fingertips! Cutting and embossing the circle with my Nestability I then left the die in place as I once again used my Copic Multiliner to add my faux stitching. Using the Hero Arts Precious Baby Boy set (it is the perfect scale for SO many projects and again TOTALLY cute!) I created the little accent pieces, coloring them with coordinating Copic markers. A little ribbon and a couple of brads completed the look. Babies --- I can still smell my girl's hair even 10 years later! What a blessing to this world they are! 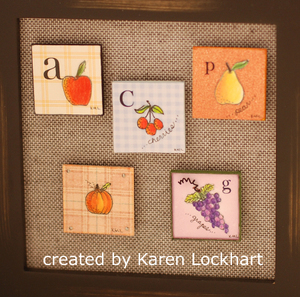 I hope that this spurs you to thinking about other uses for these adorable chipboard coasters! 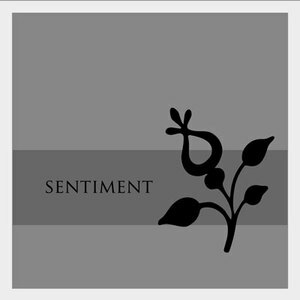 I would love to hear your thoughts and suggestions as to what you would use them for. Have a fabulous evening and thank you for stopping by today. Our product focus this week in the CLASSroom is Hero Arts. We have had so much fun with this "new to us" product line and today I would like to share a little insight into the "Hero Hues" portion of the line. Be certain to read to the bottom of this post to also learn how you can participate in our blog candy drawing! these are A2 size - 4 1/4" x 5 1/2"
Sunshine Mixed Accents - these packets include both Pearls and Gemstones. Select from three different colors of pearls and/or three different colors of gemstones in a variety of sizes. This is an amazing value, that offers so much versatility! Hero notecards and layering papers are what we refer to as "duplex cardstock." Duplex cardstock simply means that it is two colors. It is a white core paper - so there is no need to line your cards if you want to write in the interior. The result is a crisp, beautiful appearance! As you can see from the color comparison above they coordinate beautifully with the Memory Box papers we already carry. The only significant difference is the subtle variance in the shape of the envelope flap. The biggest reason I am sharing this information is because each line has a unique color palette, and it is incredible to me how well they coordinate. Please read on if you would like to help me answer a question I have and win some blog candy by doing so! You know me - I can't just talk about something without creating a project. I must admit that I feel TOTALLY rusty though. Returning from Ranger U I was sicker than I have been in years and it is just now that I am finally getting back up to speed. So today I am going to share a little of what I learned thanks to Claudine and Tim. I still hope to do a blog post on my experience --- it was absolutely marvelous and the women I met... AMAZING! Now on to the creativity! For this technique I used the Snowcap Dabber. Ranger has reformulated these and they now work like a dream. Using my Clear Design Hero Arts stamp I "inked" it with the dabber. My bottle was fresh from the factory and so to start it out I turned it upside down on my craft sheet and gave it a slight squeeze until I could see the ink peek out from the edge. I should have taken a picture of this --- sorry about that, hindsight is 20/20. Stamp the image and repeat until the notecard front is covered. 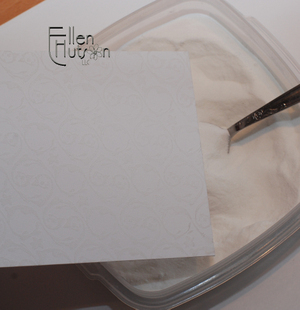 Be careful because it is a little "slick", but if you stamp gently you should not have any mishaps. I wanted to "shabbify" the cardfront to coordinate with the Basic Grey Green at Heart paper I had selected prior to starting. Gently heat set the ink. Then using Tattered Rose and Worn Lipstick Distress Ink and the Ink Blending tool I sponged the ink overtop the stamped designed in a circular motion. Leaving some portions of the cardstock bare brought the look of the notecard in to accordance with the decorative paper. Another new toy --- oops I mean tool --- I have been wanting to play with are the new Alterations dies. I realize that they take up more storage space than the Nesties but there is an advantages to this product that I love. The depth of the blade allows me to cut all sorts and manners of things that are thicker than the depth of the blade on the Nesties. Today I used it to cut the Sticky Back Canvas. It is a good thing that I always like to try the tools that I am recommending. What I came to realize today is that my label didn't immediately pop out of the die. Using a long thin needle I was able to pull it out of the die after cutting, but realized that perhaps I was missing something. I contacted Tim and he immediately replied letting me know that a "fix" is in the works. He put me in contact directly with Ellison and I was able to get an immediate resolution to my little quandry. If you have purchased one of the new Sizzix dies that have an "open" middle - as in the new dies that Tim has designed that have the magnetic component, and are having trouble with getting your piece back out after it has been cut, then please give Ellison a call at (877)355-4766. They will be shipping out a "center piece" to help solve our problems as quickly as possible. These have been ordered and they hope to have them available by the end of this month/beginning of next month. The die cuts perfectly, and works perfectly as designed, but wouldn't you know it - there are people like me who want to use the die without the keyhole - LOL! Ellison was most gracious and accomodating and I trust that we will be well taken care of. So forge ahead ladies - this really is a marvelous little tool! This is an absolutely lovely technique that Claudine taught us at Ranger U. If you ever have the opportunity of taking a class from her you must! She is witty, sweet, knowledgeable and passionate. I could just hear her words as I mixed up my paint mixture for this technique. Now I hear Claudine's voice as she instructs us to have our thinned paint ready for the next portion. You want to have this paint watery, like the consistency of "skim milk" (yep, I can relate to skim milk :-D) I mixed Sky Blue and Dab of Yellow as shown in the wonderful chart she created and has shared with us here. Then using a mini mister I spritzed this mixture with water and stirred. The green in this photo is the correct consistency, the pink is a mixture of Painterly Pink and Dash of Red (to coordinate with the Punch color) before the water is added. I use either the end of my paint brush to dab just a dot of paint onto my craft sheet and then wipe it with a paper towel before dipping into my second color to avoid mixing the colors in the pots. 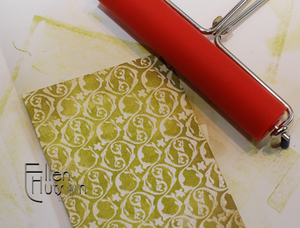 Once you have your colors mixed you will then ink your stamp with a Watermark or Resist Ink. 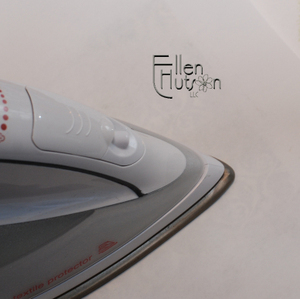 Immediately (do NOT allow the ink to dry) gently paint your wash over the canvas surface. You can see how the paint beads up and "resists" the area that is covered with the resist ink!!! SO COOL! Another element that I adore with whitecore or duplex cardstock is the ease of creating lovely texture with the embossing folders. We are thrilled to announce that we have brought in some beautiful textured folders from Sizzix. 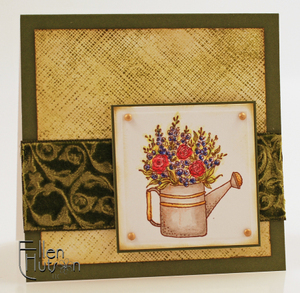 These are essentially the same as the Cuttlebug embossing folders, but perhaps just a little "crisper" in the appearance of the finished embossed design. Tim's folders are still not available, but we hope they will arrive soon! Today I used a beautiful new Damask style design. Please note that when you emboss on duplex papers it is important to think about which side is "up." The picture above helps to demonstrate this. I put the color side of the paper facing the side that has the Sizzix logo on it. This ensures that the positive design will pop upwards on your paper. Sometimes it is desireable to have the reverse, but typically this is the most attractive appearance. As you can see just by running it through the Big Shot the details begin to appear in white. By gently sanding the surface with a Lucky Squirrel sander, or a Tim Holtz sander the design is enhanced even further. In trying to figure out how to utilize this element in my card I came up with the little tag above. Utilizing the one-sided embossed notecard above I was able to stamp the sentiment on the smooth portion and use the textured portion to add some flair to the little tag. Cutting it into a "flag" shape, sanding the edges to shabbify the tag and then putting a little curl and affixing with glue dots completed this portion of the project. Last, but certainly not least was the addition of the Hero Hues Art Flowers. There is a huge assortment in each package. 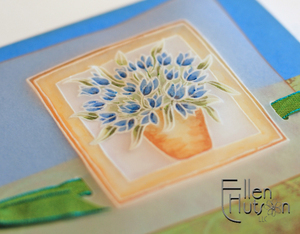 I decided to share how you can use these little one layer flowers to create a glorious blossom. If you would like me to show a step-by-step photo technique on how to create these please let me know. Essentially all you need to do is to begin with the largest size, then select the next size down, and finally select another blossom that is similar sized and cut out two of the five petals. Use these elements in the center of your flower. I used a Jenni Bowlin stick pin to hold it all together. This selection of goodies could be yours - please leave your answer to the the following question in the comments section below. Comments will be eligible for this random drawing if left before Saturday, April 10th at midnight. Would it be helpful to have a color comparison of the Hero Arts cardstock collection and the Memory Box collection? Also add if you have ever used either of these collections and if so, which one? Being one who does not mind doing the work if it is helpful to our customer base I would be happy to do so, but I do not want to spin my wheels if there is no need for this comparison. Please let me know your thoughts and ask any questions regarding this line below in the comments section to be entered in our random drawing. Once again we would like to encourage you to try the Hero Arts line of products by offering you a 15% discount for the next week. The promotion code HeroHues15 will be valid on all orders placed between now and midnight April 14th. Please enter this code upon reaching the checkout page. Note that upon completion of your order the discounted price will be listed on the individual product line and not at the end of the invoice. This promotion is valid on all in-stock Hero Arts products only and cannot be combined with any other coupon code (frequent shoppers please place two separate orders and notify us at customerservice@ellenhutson.com immediately upon completion of both orders so that we can combine your orders for shipping if you would like.) For the best selection be certain to shop early! 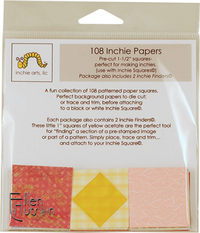 Today I am going to do my best to share with you the ease of using this program and how I incorporated the "digital" aspect together with my traditional paper crafting products. I am also going to share how I created the mini crepe paper roses - they were so much fun to make! Following are a series of stepped out pictures showing you how simple it is to create using the ScrapHD builder. You will see a new "icon" on the sidebar of all of our blogs - this icon when clicked on, will take you directly to the Ellen Hutson, LLC + ScrapHD builder. Joining is free and there are some wonderful free options available to try, but I must admit that I was a free member for such a short time that I am uncertain to all that is free. I am now a "Club Member," which costs $9.99/month or $99/year and so when I sign in now everything is ready and waiting for me to explore and experiment with. Each one of the following "tiny" windows can be popped open to reveal an example of the steps involved I followed as I printed my transparency. I selected backgrounds because I knew that I wanted to keep this lesson simple. Next, select the little + symbol and a whole new world of paper options opens up to you as seen in the second photo. I used the search mechanism and put in the word Tangerine in doing the write-up for this post because I knew the name of the Jenni Bowlin paper collection I had used and wanted to keep my options down. I can use colors, designers, collection names, elements and more to narrow down my search. Simply clicking on the paper element I wanted to add puts it into my left column. You can select as many backgrounds to try as you would like. I only selected the one I knew I was going to use. When you have completed selecting background papers click on done. This will close the selection window. Then drag the paper from the left tray into the square and drop it in place. My pattern was now ready and so I then selected the "Print from Home" option. An email notification was then sent to me, but I decided to show you how to go to "My Account" and you will find the page under "My Scrapbook." Click on the green download button next to the image. A box will pop up and I select save. The files are emailed in a zipped format. When the next window pops up simply click open and it will show you a window similar to the first photo above. I select extract all and this unzips the file, giving you easy access to it. Next I opened Office Word. In word there is an "insert picture" option. When your browser opens simply select your file in your ScrapHD folder and click on the file and then insert. It is now simple to resize the file - note where my arrow is pointed above. I resized the file to 4". I then printed on to my transparency. This write-up took WAAAY longer than actually completing all of these steps - LOL! It truly is a very easy process! Being that I am all thumbs I decided to try using my quilling tool (also known as a slotted tool) to help me keep my flower precise. It worked like a charm! Remember each of these pictures can be clicked on to open in a large view. Begin by folding the crepe paper over as shown in the first photo above. Then slip the ends between the two prongs on the quilling tool as shown in the second photo. Wrap a couple of times and then using a toothpick dab a tiny droplet of adhesive at the base of the flower. The last photo in the series above and the first photo below show the alignment of the paper as you wrap. Fold the ribbon at a 45 degree angle and then keeping the top portion (the portion that is parallel to my finger) even with the top of the rose wrap until this segment of the ribbon is used up. Then make another 45 degree fold, add a droplet of adhesive to the base and wrap again. Continue to wrap and glue until you reach the end. At the end I apply glue to the tail as well as the base and finish off as shown in the third picture. I then remove my rose from the slotted tool and add adhesive to the base, allowing it to dry thoroughly. 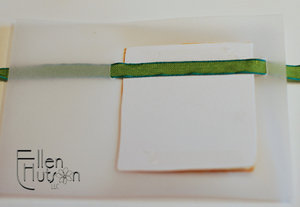 Simply vary the length of your crepe ribbon to vary the size of your rosebud. I apologize for not writing down the lengths of ribbon I used - I thought I would remember. Oops-LOL! I think that the lengths were between 6-12 inches when I began, but can't be certain. I cut one of the Jenni Bowlin mini papers down to a 3" size and pierced holes through the corners of my transparency and mini paper inserting a brad. The look was completed with some of that gorgeous silk ribbon we carry, some softly Glitter Misted leaves and my three crepe paper roses.